From the end of August, two thirds of the redeveloped and redesigned London Bridge Station will be open to the public, including most of the new concourse, which is larger than the Wembley Stadium pitch. The August Bank Holiday opening will also see new walkways around the station as well as shops and a ticket office. However, Sussex passengers will see little change in their service to London Bridge until the project has been completed in early 2018. 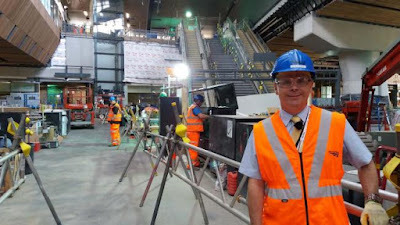 Simon Blanchflower, Thameslink Programme director, said: “In August we will open the doors of the first two thirds of the new station and people will see the massive scale of the work we have been doing. From early 2018, the station will have 65 per cent increased capacity with 15 new extra-long platforms, capable of accommodating larger trains. This will see up to 24 services per hour in what project bosses have described as being a London Underground like frequency. Govia Thameslink (GTR), which runs Thameslink, Southern and Gatwick Express services, will begin a public consultation later this year for an extended timetable which will start after the completion of the 2018 works. A spokesman said that while still in the early stages, bosses plan on introducing an additional 1,000 standard seats in the morning peak. This will be made possible by Network Rail, which runs London Bridge, giving Thameslink two dedicated platforms for their new 12 carriage trains. Before Thameslink has shared platforms with the likes of Southeastern, which has led to congestion and delays. 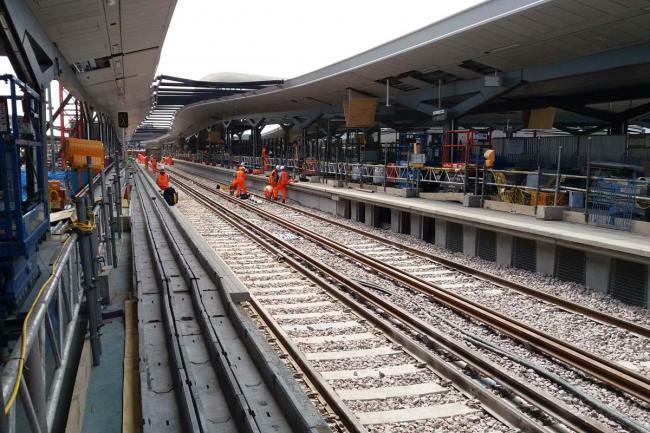 The Thameslink service into London Bridge has been disrupted since January 2015 while building work has been ongoing. At present they have just three of their existing six approach routes to the station. By 2018 this will be back to full capacity. But project bosses are promising more than a station, with 70 shops, bars and restaurants set to open in and around the concourse. As well as coffee shops - Nero and Costa - and a Boots chemists, Andrew Hutton, the project’s lead development manager, said there will be “destination” restaurants and shops. While the identities of many of the outlets are yet to be confirmed, Mr Hutton pointed to St Pancras’s hugely successful shopping precinct as a comparison. He added that designers had rethought the way stations are set out in a bid to improve the flow of passengers and speed they can get around the site. He said: “The platforms are centred as such that passengers gain no advantage or disadvantage from where on the platform they are. “The concourse is designed in line with this so people should be spread out and there will be much more room. He added that the project is on time and on budget, which is £1bn. The development is part of the Government sponsored Thameslink programme which aims to transform north-south travel through the capital. As well as the new London Bridge station, this has included the redevelopment of Blackfriars, improved connections north to Cambridge and Peterborough, new tracks, signals and longer trains. Keen to give long-suffering Sussex rail passengers some good news, Network Rail invited The Argus for a sneak peak behind the hoardings. The scale of the project is immense, with hundreds of high-vis clad workers finishing off bits and pieces in every corridor, tunnel and opening. Just as they say you are never further than 12ft from a rat in the capital, you are never more than half that from someone in a hard hat. It is one of the biggest building sites in the country and once completed in 2018 it will boast 15 new platforms, the country’s largest concourse, a shopping arcade, cafes and restaurants, new walkways and a ticket office. One of the main challenges Costain, the contractors working on the project, has faced during construction is enabling the country’s fourth busiest station to continue day to day operations. And as any commuter can tell you, it has not been without issue its problems. The Bedford bound Thameslink train has not been able to stop at London Bridge, with Govia Thameslink Railway (GTR) only able to run shuttles to and from Brighton – and then only during off peak. And because of the disrupted services being sent off to already busy stations such as London Victoria, any issue on the line creates more disruption – up to four times more, it is estimated. This will change, Mr Hutton promises, as he leads us through the bowels of the station, up ladders and along walkways, before we reach one of the new platforms. Longer than the neighbouring Shard is high, these are set up for Thameslink’s new 12 carriage Class 700 trains. At present most of the trains that run the route are made of just eight carriages. The extra space will help the operator put on an extra 1,000 seats during the morning rush. Back down below the station, minding the many miles of wires and cables as we go, we come up at the pièce de résistance, the concourse. Despite the cranes, trucks and other assorted machinery littered around, you get a sense of its immense scale. The concourse is on ground level with all platforms above. There are 24 new escalators disappearing up into the heavens, space for 70 shops, bars and restaurants and sets of stairs going off into all four corners. When finished it will increase the capacity of the station by 65 per cent and make London Victoria’s concourse feel like Hove’s. And it’s not just big, it’s clever as well. 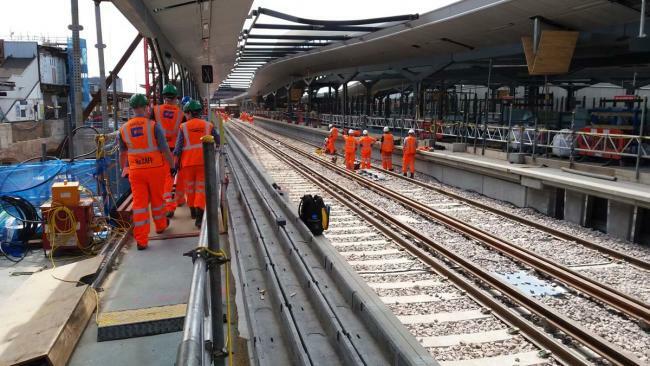 The train platforms are built on multiple levels ensuring less of a backlog when there is a problem on the approach. And look up from the concourse and you see all the undersides of the platforms have cedar wood cladding. Not only does this break the monotony of the grey concrete, but also dampens the sound from the trains from above. The great stations of the world are no longer just an arrival or departure point. They are somewhere to go to shop, to have lunch or to spend an evening. Case in point is London’s St Pancras, which reopened in 2007 after an £800 million rebuild. Shoppers head to the station regardless of whether they need to catch a train, just to wander around its designer shops and trendy cafes. Mr Hutton singled out the station as a comparison, promising a variety of businesses by the time it is finished in 2018.